The brown field site was turned into a commercial retail center with sustainability in mind. The food market has a parking deck on the roof to reduce the parking footprint on the site. 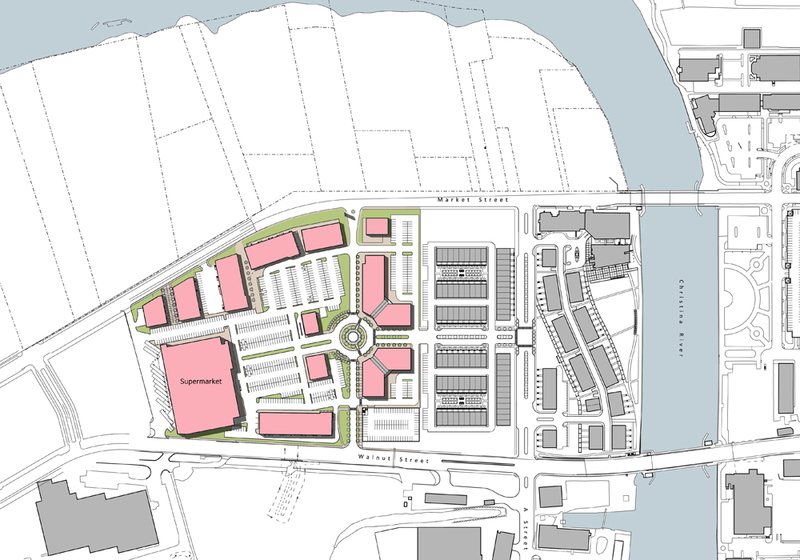 The retail center, implemented by the Buccini Pollin Group, is one additional step of a much larger vision for the South Market district of Wilmington. Earlier development by BPG in this district saw the addition of a combination of townhouses, apartments and condominium residential units, along with their own corporate headquarters building. In order to support additional residential and corporate development, the master plan called for a retail center that would have the retail amenities needed to support a community. The retail center’s anchor tenant is a national supermarket chain. The supermarket is a 75,000 SF building designed specifically for this use. Parking on the roof deck for approximately 200 vehicles is in addition to the surface parking, making it more convenient for the customer. The site was a brown field, requiring much of the existing soils to undergo a decontamination process. All of the storm water is contained and filtered through the use of below grade infiltration beds.